Add that finishing touch to a renovated room. Child’s room, Guest room, Bathroom or Entertainment room or any other room that requires that personalised touch. Using fine sandpaper, sand edges and flat sides of wooden light switch cover to remove rough edges. Using Dala Craft Paint, paint entire light switch cover, including the edges. Allow to dry and apply second coat at 90 degrees to first coat. Wet sand the front cover. (Fine sand paper dipped in water and sunlight liquid solution.) Rub the sand paper over the painted surface with a gentle circular motion. Wipe excess water off and hair dry to ensure that it is totally dry. Use Dala Craft Paint (neon yellow) when painting entire light switch. Stick adhesive stars onto the yellow paint and press all corners down firmly to ensure they are stuck down very well. Apply Dala Craft Paint (navy blue) over stars and yellow paint, ensuring that no excess paint accumulates around the stickers. Pull stickers off to reveal the neon yellow shapes. Apply Dala Hard Varnish over entire surface, using a piece of sponge. Allow to dry. Apply second coat of varnish if required. Cut out required pictures from wrapping paper and decide where each picture must be stuck. Apply layer of Dala Podge onto painted surface and, while podge is wet, apply podge to reverse side of picture and place it in the desired position. Dip index finger into podge and smooth it over the picture working from inside to the outside. Apply Dala Podge over entire surface using index finger, ensuring that podge layer is even. Allow to dry and apply another layer of podge at 90 degrees to the first layer. Apply Dala Hard Varnish (with a sponge) and allow to dry. Second coat of Hard Varnish may be applied if necessary. 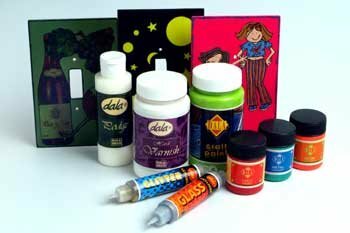 Decorate with Dala Craft liners and Dala Glitter liners. Cut out desired pictures from a serviette. Holding a piece of prestik in each hand, pull the layers of the serviette away from each other until only one layer remains. Apply Dala Podge to the light switch cover as well as the reverse side of the serviette. Position serviette picture and smooth it out with Dala podge on your finger. Work carefully from inside outwards and cover entire area. Apply 4 layers of podge in total and allow to dry between each layer. Decorate with Dala Craft Liners. Unscrew your outdated PLASTIC light switches and replace them with your CRAFTY new hand-made light switch covers. It will draw the attention of your guests and make you the envy of your friends. This item has 759 views.